These ACE products are self-contained systems, filled with pressurized nitrogen. The filling tolerance is between -20 N and +40 N. The gas spring consistently works in a temperature range from -20°C to +80°C. Hydraulic oil is used for the end damping. On the extension stroke of the gas spring, the nitrogen gas flows through the metering orifice in the piston to provide a defined feed speed. In operation the gas spring acts against the weight force of the lid. When the flap is opened, the nitrogen gas flows through the orifice in the piston and supports the force of the hand. The oil filling provides a gentle damping to rest for the end position. The metering orifice controls the extension and compression velocities. 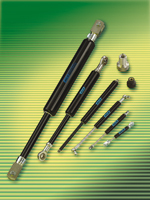 The gas spring can be mounted in any position. We recommend, however, mounting it rod down to use the end position damping. The force can be adjusted by means of an integral valve. Many interchangeable parts are available for an easy mounting and installation.